Here is the next batch of Kropotkin beard covers. 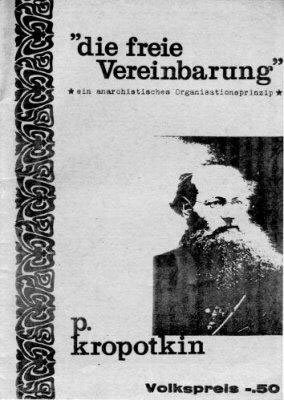 Like I mentioned last week, most covers of books by classic anarchist protagonists seem to focus on portraits, but since most of said dudes lived in the 19th or early 20th century, their are limited photographic or photo-like representations of them, so the same basic images get cycled through over and over again. 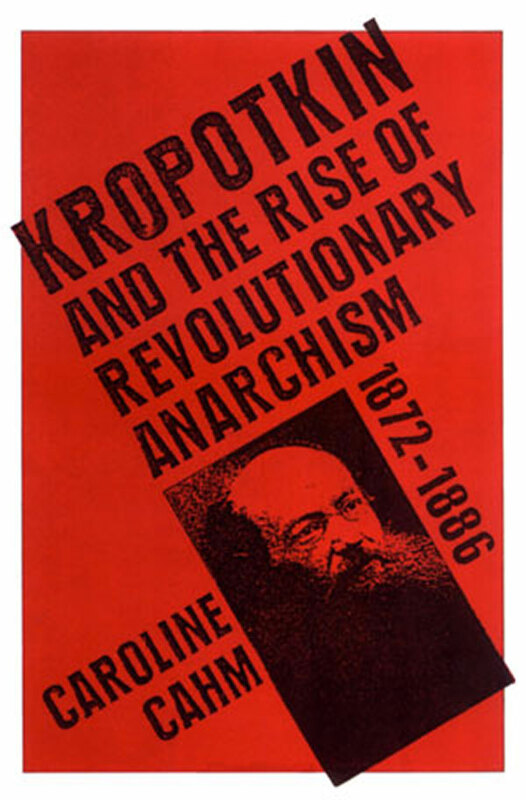 The cover to the right, for Caroline Cahm’s study of Kropotkin from 2002, mixes an often used image with an edgy and well-designed type treatment. Although the time period covered by the book pre-dates the constructivist style by 40-50 years and makes little actual sense in relation to the subject, the cover looks cool, and is far superior to most of the Kropotkin books out there. 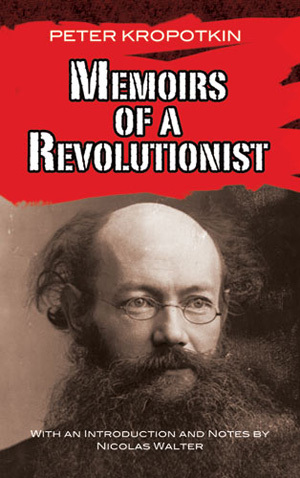 The actual image of Kropotkin is also nicely distressed, looking almost photocopied, which adds an additional anachronism to the design and a solid post-modern “wink-wink” to the rest of it being out-of-time. 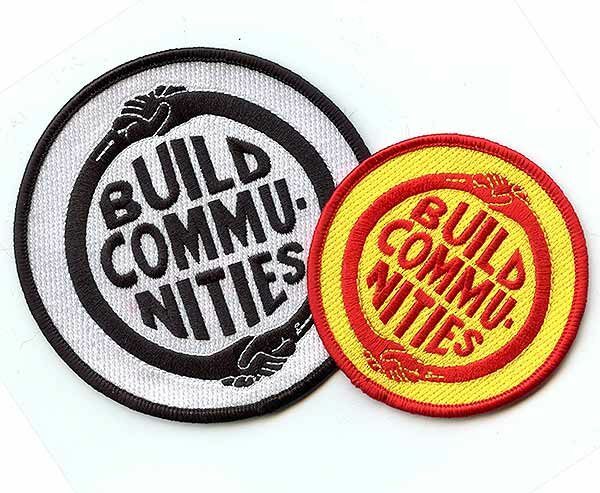 The image is listed as being courtesy of the International Institute of Social History in Amsterdam, but the designer is not noted. In addition, and it is hard to see at first glance, the source photo for the cover image is the same one as the cover for the Grove Press edition of Memoirs of a Revolutionist I featured last week. For each cover like the Cahm one above, there are a dozen clunkier and more conservative ones like those below. The 1972 NYU Press edition of Conquest of Bread to the left is not so bad, the squeezed and tall author title is nice, and the brown and reddish orange is a classic 70s color combo. But just dropping the framed portrait below the titles is completely unimaginative. The German pamphlet to the right (published by Projektgruppe autonomes Jugendzentrum in 1975) is a bit of a disaster, with the weird flowery line of edging the same old, same old, portrait justified hard right. 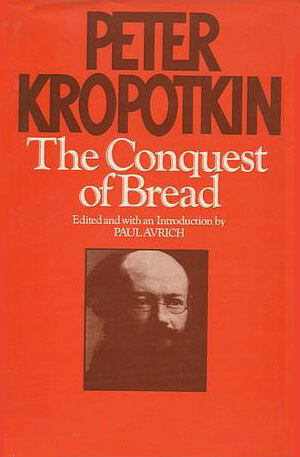 Kropotkin’s writings have long been in the public domain, and have been published in English by dozen’s of presses. 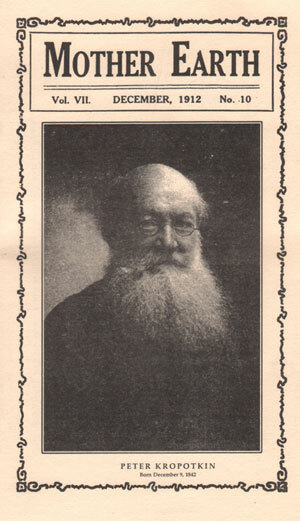 One of the mainstays of keeping public domain texts in print has been Dover Press, and they have had a evolving array of editions of Kropotkin’s works available for over 50 years. 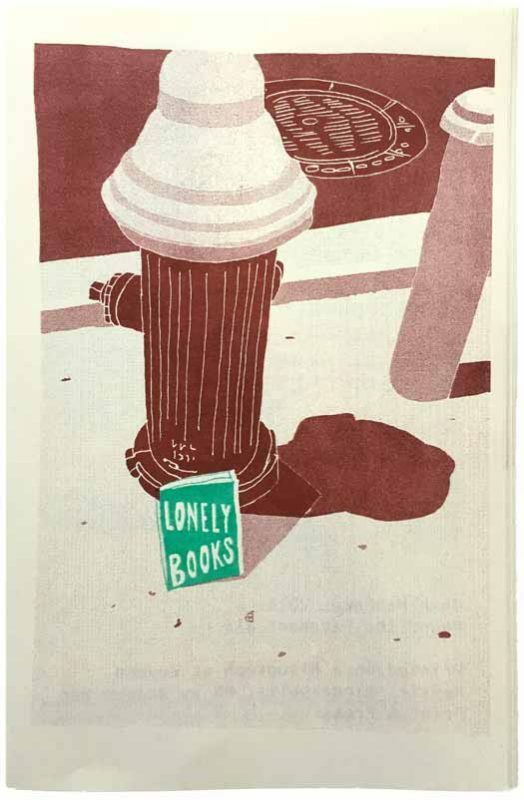 Unfortunately they rarely give much attention to their covers, maybe because they try to keep the books at extremely low prices. 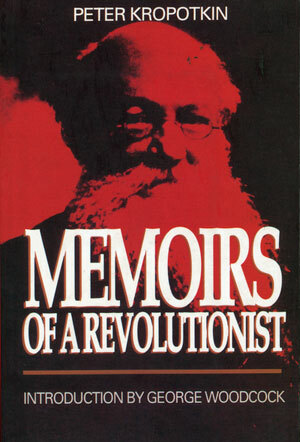 The 1988 edition of Memoirs of a Revolutionist is typical no-frills Dover, a photo portrait (the same portrait as all 4 books above) with very simple type treatment laid over it.The recent Dover edition of Mutual Aid (to the right), on the other hand, is a train wreck of trying to have some design sense, but completely failing. 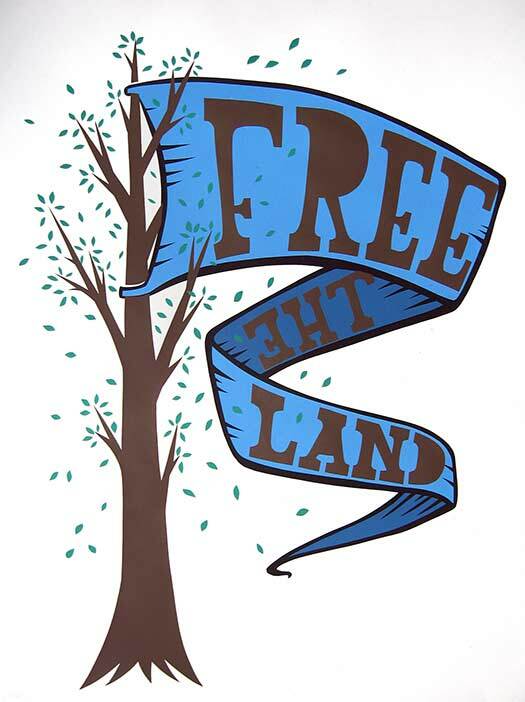 The type treatment is awful—is that just Times New Roman?—and the photoshop filter on the image is terrible. The only redeeming quality is that the weird image filter makes it look like his beard has gone completely anti-gravity, shooting straight out of his chin at a 45 degree angle. The 2010 Dover edition of Memoirs is quite strange. 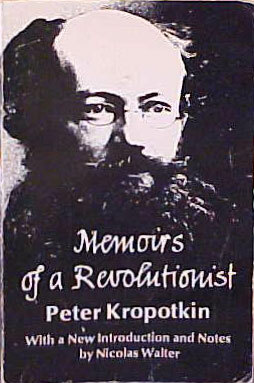 The photo appears to be a straight reproduction of the source, in which Kropotkin looks disheveled and comb-less. 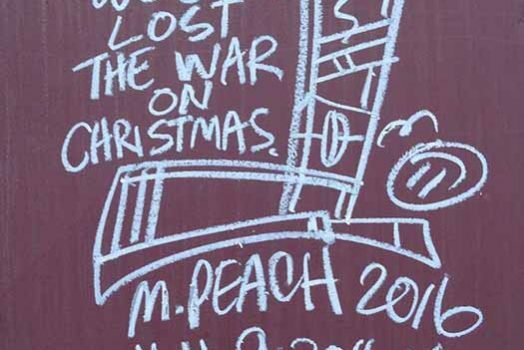 The photo completely clashes with the scratchy computer filled red streaks at the top, and militaristic stencil titling font. The type-treatment seems to be a gesture towards the “revolution” in the cover, maybe trying to appeal to a more youthful Che Guevara-loving set, but the photo destroys any hope of Kropotkin looking tough or hip. 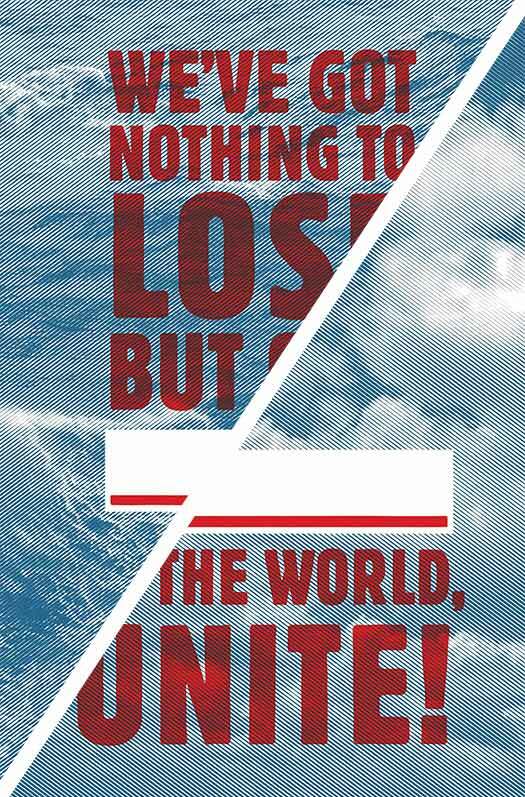 A 2009 edition of Mutual Aid from Madrid is much better, though nothing fancy. 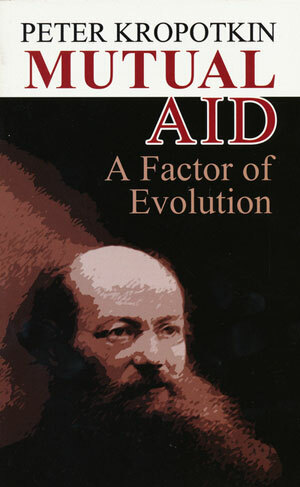 Once again the same portrait is used, but the extreme close-up centers Kropotkin as the focus, and the modernized sans serif type face works well. 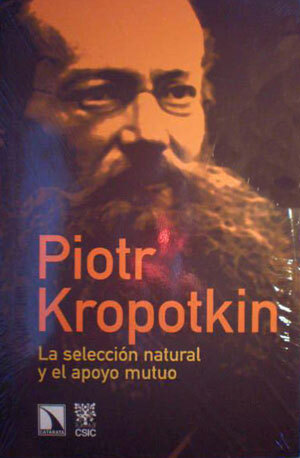 Here’s a set of covers using a different photo, the much older and whiter bearded Kropotkin. 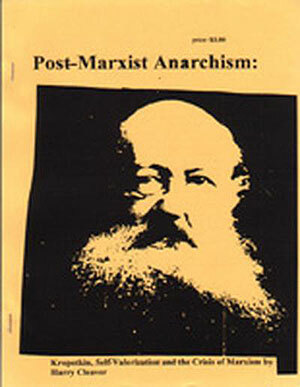 While the uneven trimming and photocopy job on the Harry Cleaver pamphlet to the left is almost charming, the use of the same image on the Dover Press edition of Anarchism from 2002 is kind of disturbing. The treatment of the photo is unflattering, and the dark background makes it looks like he is both decapitated and that his chin has exploded. 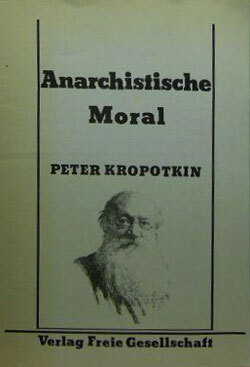 The German edition of Anarchist Morality (Verlag Freies Gesellschaft, 1978) uses a more classic-looking and inviting version of the image, Kropotkin looks more like the smart, wise, elderly grandfather of anarchism he is often considered. 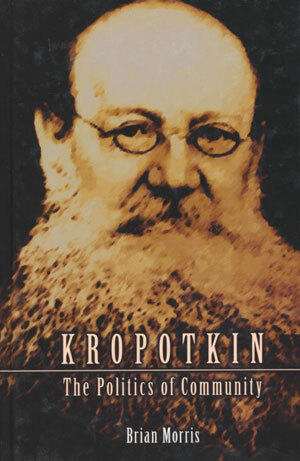 While a bit better than the Dover cover above, the Brian Morris study of Kropotkin recently published by Humanity Books (designed by Jeff Schaller) makes many of the same mistakes. The computer filter on the image doesn’t add much, and unfortunately makes his beard look like a coral reef. 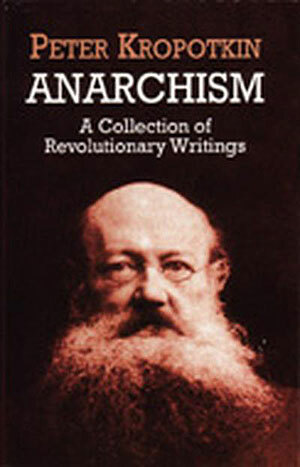 The cover below to the left is one of the many Black Rose editions of Kropotkin. Most (if not all?) have the same portrait, in different color variations, with the title in drop-shadowed serif type. I guess maybe they get points for consistency. And for the final beard cover, the original source photograph as published on a 1912 edition of Emma Goldman’s journal, Mother Earth. minus the Mother Earth cover. Josh, that’s a good point. 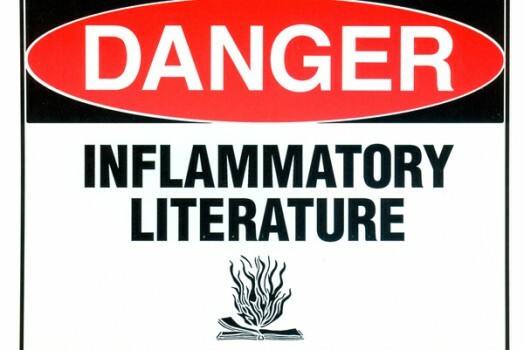 because of the antiquated aesthetic.